The article shows that IQ does not equal success but that emotional components that are not captured by the traditional IQ are very important for success. The article shows how the notion of emotional intelligence and EQ development have recently become widely accepted. The article shows how personality and IQ can not fully describe all dimensions of human psychology but that EQ can fill out the missing dimension. The article shows the main components of emotional intelligence: Self Awareness, Self Management, Auto Motivation, Social Awareness and Relationship Management. The article gives a short but comprehensive summary of emotional intelligence. In the 20th century the focus was on IQ, not on EQ. The concept of IQ was conceived at the end of the 19th century and was initially used as a predictor of academic success. As the concept of IQ became popularized it was more and more used as a predictor not only of academic success but also of work success. While it is true that people with a high IQ are more likely to be “successful” at work than people with low IQ, there is a large gap in the correlation between IQ and success. Many people with low IQ are successful, while many people with a high IQ are unsuccessful. If you look at success at work and also success in private life, it is even more obvious that IQ alone does not determine success. A highly intelligent manager in a manufacturing company is unable to control his anger when faced with mistakes made by his team. He yells at people, his team fears him and both he and his team are unproductive. A highly intelligent teenager is not able to get himself motivated to study for school. Even though he has superior learning abilities, he sits all day in front of his computer playing video games. Eventually, he has no academic success and drops out. A highly intelligent computer programmer is required to work with other programmers on a large project. Even though he has exceptional programming skills, he is unable to communicate effectively with other team members. His work is inferior despite his programming skills and superior IQ. A highly intelligent researcher is promoted to a management position within her research facility. Even though her research skills are excellent, she is very shy and afraid to speak in front of a group. With her lack of confidence, she is unable to lead the group and the overall result of the research facility is disappointing. In all of these cases, you see individuals with superior IQ who are not successful because of problems related to their emotions: lack of emotional control, lack of motivation, lack of communication skills and lack of leadership skills. There are many skills, unrelated to IQ, that are critical to our success. And all of these skills are associated with emotions. This realization led to the concept of EQ. The concept of EQ developed in the 1990s. Before that time, the sole focus was on IQ. The concept of IQ was developed around 1900. It was in 1900 that Alfred Binet, one of the founding fathers of the IQ concept, began administering IQ tests to school children. In 1918, the US army started testing all their recruits for IQ. In the following decades, IQ became more and more popularized, so much so that it is now a household word. From 1900 to 1990, the only focus was on IQ and not on EQ. Around 1990, people came to realize that IQ was not the only predictor of success. There were other important components influencing success in private life and business life that were not captured by IQ. However, there was no unified concept for other components that influenced success. The first three components (verbal/linguistic, logical/mathematical, visual/spatial) are included in the traditional concept of IQ. The musical and bodily/kinesthetic components reflect a general skill level in important activities of music and sport. The last two components, interpersonal intelligence and intrapersonal intelligence, relate to emotions and are predecessors of the current definition of EQ. By 1990, Salovey and Mayer coined the term "Emotional Intelligence". 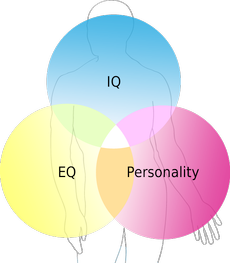 They formulated the Emotional Intelligence, EIQ, that was independent of IQ. However, EQ was not popular until Daniel Goleman published his bestselling book, Emotional Intelligence, in 1995. That book sparked public interest in the concept of EQ and led to an avalanche of articles and books. In the late 1990s, emotional intelligence became one of the hottest buzz-phrases in contemporary psychology. As of today, EQ has become recognized as the measurement of an important set of skills; the recognition of its importance in determining success is clear. For more than 100 years, psychologists have measured IQ. For even longer, psychologists have measured human personality. IQ and personality were thought to describe the complete human psychology. Personality tests measured the inherent personality traits and IQ tests measured the intellectual skills. This was thought to be a complete measure of human psychology. However, before the introduction of the EQ concept, there was a “gap”: there were some kinds of skills that were neither part of the set of IQ skills nor part of the personality. Also, it was noticeable that the IQ did not correlate well with success. It was long known that there were factors other than IQ that could explain success and that many of these factors had to do with emotions. However, these factors often were seen as part of the personality. For example, persons of low intelligence might be successful because they were “people persons” or because they were highly motivated. On the other hand, persons of high intelligence may be unsuccessful because theye were shy or lacked initiative. However, the above traits are not personality traits but rather “personality skills”. A person might have a personality trait of being introverted but still have a personality skill of being a “people person”. While IQ and EQ describe a skill level, personality does not. Instead, personality describes stable traits of a person’s personality. These traits do not relate to skills. Neither IQ nor personality are able to measure the skill set that composes EQ. The addition of the EQ concept to the concepts of personality and intelligence has completed our view of the human psychology. Now psychologists know that every person has a personality, a certain level of IQ and a certain level of EQ. The personality describes how a person inherently "is"; for example, introverted or extroverted or “thinking oriented” or “feeling oriented”. If you want to know your personality, take the free Swiss 16 PT Personality Test. The IQ measures your intellectual skill level. It measures your ability to think logically, absorb information, transfer knowledge and solve problems. It is a very good predictor of success at school but not good at predicting success at work or in private life. The EQ measures your emotional skill level. It measures your ability to understand your emotions, to control your emotional reactions, to motivate yourself, to understand social situations and to communicate well with others. It is a good predictor of success in your private life but not good, in itself, at predicting success at school or work. However, the combination of EQ and IQ is an excellent predictor of success at school, work and in private life. The three circles in the diagram above overlap. This is to show that while EQ, IQ and personality are independent, there are some correlations. People who have a “thinking oriented” personality tend to have a higher IQ but lower EQ than people who have a “feeling oriented” personality. This is not to say that every person who is “feeling oriented” will have a high EQ and a low IQ, but there is some correlation between the two. Also, people who are introverted tend to have a higher IQ but lower EQ than people who are extroverted. People with a low IQ tend to have a low EQ; as the IQ increases, EQ generally increases also. However, as the IQ becomes very high, the EQ generally decreases. This is not to say that there are no low IQ people who have a high EQ or that there are no IQ geniuses who also have a high EQ, but worldwide research indicates these trends. Emotional Intelligence (EI), often measured as an Emotional Intelligence Quotient (EQ), describes the ability to perceive, and manage the emotion of one's self, of others, and of groups. Salovey and Mayer's conception of EI strives to define EI within the confines of the standard criteria for a new intelligence. Following their continuing research, their initial definition of EI was revised to: "The ability to perceive emotion, integrate emotion to facilitate thought, understand emotions, and to regulate emotions to promote personal growth". The ability based model views emotions as useful sources of information that help one to make sense of and navigate the social environment. The model explains that individuals vary in their ability to process information of an emotional nature and in their ability to relate emotional processing to a wider cognition. This ability is seen to manifest itself in certain adaptive behaviors. Perceiving Emotions: the ability to detect and decipher emotions in faces, pictures, voices, and cultural artifacts- including the ability to identify one’s own emotions. Perceiving emotions represents a basic aspect of emotional intelligence, as it makes all other processing of emotional information possible. Using Emotions: the ability to harness emotions to facilitate various cognitive activities, such as thinking and problem solving. The emotionally intelligent person can capitalize fully upon his or her changing moods in order to best fit the task at hand. Understanding Emotions: the ability to comprehend emotion language and to appreciate complicated relationships among emotions. For example, understanding emotions encompasses the ability to be sensitive to slight variations between emotions, and the ability to recognize and describe how emotions evolve over time. Managing Emotions: the ability to regulate emotions in both ourselves and in others. Therefore, the emotionally intelligent person can harness emotions, even negative ones, and manage them to achieve intended goals. The EI model introduced by Daniel Goleman focuses on EI as a wide array of competencies and skills that drive managerial performance, measured by multi-rater assessment and self-assessment (Bradberry and Greaves, 2005). In "Working with Emotional Intelligence" (1998), Goleman explored the function of EI on the job, and claimed EI to be the strongest predictor of success in the workplace, with more recent confirmation of these findings on a worldwide sample seen in Bradberry and Greaves, "The Emotional Intelligence Quick Book" (2005). Self Awareness: The ability to read one's emotions and recognize their impact while using gut feelings to guide decisions. Self Management: Involves controlling one's emotions and impulses and adapting to changing circumstances. Social Awareness: The ability to sense, understand, and react to other's emotions while comprehending social networks. Relationship Management: the ability to inspire, influence, and develop others while managing conflicts. Psychologist Reuven Bar-On (2006) developed one of the first measures of EI that used the term "Emotion Quotient". He defines emotional intelligence as being concerned with effectively understanding oneself and others, relating well to people, and adapting to and coping with the immediate surroundings to be more successful in dealing with environmental demands. Bar-On posits that EI develops over time and that it can be improved through training, programming, and therapy. Bar-On hypothesizes that those individuals with higher than average EQ are in general more successful in meeting environmental demands and pressures. He also notes that a deficiency in EI can mean a lack of success and the existence of emotional problems. Problems in coping with one’s environment are thought, by Bar-On, to be especially common among those individuals lacking in the sub-scales of reality testing, problem solving, stress tolerance, and impulse control. In general, Bar-On considers emotional intelligence and cognitive intelligence to contribute equally to a person’s general intelligence, which then offers an indication of one’s potential to succeed in life. Petrides proposed a conceptual distinction between the ability based model and a trait based model of EI. Trait EI refers to "a constellation of behavioral dispositions and self-perceptions concerning one’s ability to recognize, process, and utilize emotion-laden information". This definition of EI encompasses behavioral dispositions and self perceived abilities and is measured by self report, as opposed to the ability based model which refers to actual abilities as they express themselves in performance based measures. Trait EI should be investigated within a personality framework. The trait EI model is general and subsumes the Goleman and Bar-On models discussed above. Petrides is a major critic of the ability-based model and the MSCEIT arguing that they are based on "psychometrically meaningless" scoring procedures. The conceptualization of EI as a personality trait leads to a construct that lies outside the taxonomy of human cognitive ability. This is an important distinction in as much as it bears directly on the operationalization of the construct and the theories and hypotheses that are formulated about it.